Anyone who has any familiarity at all with the history of children’s clothes is aware that both boys and girls were dressed alike during the first few years of their lives for several centuries. Then, typically between four to seven years of age, boys were "breeched," that is, put into breeches, trousers or pantaloons, while girls continued to wear dresses. But this change of wardrobe was not done at a moment’s notice or on a whim. From at least the mid-seventeenth century, most mothers planned this very significant event in the life of their boy children with great care. Some even delayed this event for as long as they could, since to some of them it meant essentially the loss of that boy child. The earliest records of breeching ceremonies for little boys are to be found in the letters and diaries from the mid-seventeenth century. But it is quite probable these ceremonies took place in many families even before that time, but they were either not recorded or those records have been lost. Few people, even among the upper classes, were literate in the sixteenth and early seventeenth centuries, and the fewest of those were women. But as more and more women acquired the skills of reading and writing, they used that knowledge to record important events in their lives and the lives of their children, including the ceremony by which their young sons would leave the domestic sphere of women and enter into the world of men. Nearly all the records of breeching ceremonies consist of mothers’ letters to their close, usually female, family members and friends about their plans for the ceremony. Some women wrote to their mothers or other older female relatives on advice on what to do and when to do it. Others requested family or friends living or traveling to large cities to procure various special items which were needed for the event. Many women also wrote about their feelings upon this impending change in the life of their little boys. A number of women dreaded it, for it meant their small sons would thenceforth be primarily under the control of their fathers. These little boys would cease to be seen as genderless children, leaving the care of their mothers to be prepared for manhood by their fathers and other prominent males of the family. Breeching marked a much more wrenching change for both mothers and their young sons in the centuries prior to the publication of Jean-Jacques Rousseau’s highly influential book, Émile: or, On Education in 1762. Before the philosophy of childhood presented in this important work, boys were not usually breeched until the age of six or seven. At that time they were immediately dressed in diminutive versions of men’s clothes and were expected to behave as small adults. Boys of the lower classes were put to work or apprenticed to a tradesman at this age, while the boys of the upper classes were typically sent off to boarding school not long after they were breeched. Thus, mothers of both classes essentially lost their boy children to premature adulthood. These young boys very often not only left the domestic sphere of women in the household, they left home altogether. By the 1770s, as Rousseau’s philosophy became more widely known across Britain, the concept of childhood as a unique and separate phase of life was acknowledged and accepted. Boys began to be breeched at a much younger age, typically between the ages of three to five. But no longer were they immediately dressed as adult men and put to work or sent to school. These boys did leave off the gowns and petticoats they had worn alongside their sisters, but their new wardrobe consisted primarily of a skeleton suit. This was a transition garment they would wear for several years before, in their later teens, they would begin to wear simplified versions of the clothing of adult men. The skeleton suit clearly indicated these youngsters were male, but just as clearly marked them as juvenile, as yet unready to take their place in the adult world. During the Regency, most boys were breeched at about four years of age. Some fathers might press for this rite of passage to take place sooner, particularly if the boy was their first-born son. Some mothers might try to delay the event, especially if there were no other infants or toddlers in the nursery. The size of the little boy also had some bearing on when he would be breeched. Boys that seemed small for their age, or very sickly, tended to be breeched at an older age. There are a couple of instances in the historical records when a breeching ceremony took place when the little boy was quite young, because one of his parents was very ill and might not survive until he reached the appropriate age. Once the child’s parents, sometimes with input and/or pressure from other family members, had decided when the boy should be breeched, planning would begin for the breeching ceremony. The scope of the breeching ceremony would be determined to a great extent by the class and social standing of the family to which the little boy belonged. In lower class or poor families, there might be no ceremony at all, the toddler might simply be dressed in hand-me-downs from an older brother when that boy had outgrown them. By contrast, the breeching ceremonies for boys of the gentry and aristocracy could be quite involved. A Regency breeching ceremony seldom took place on the little boy’s birthday. That life milestone was not regularly celebrated in the early nineteenth century and seems to have been less important than the choice of a time when the boy was deemed to be ready and the majority of extended family members could be present. Among the upper classes, the breeching ceremony was more likely to take place at the family’s country home than in London, particularly if the boy to be breeched was also the heir. Planning for the ceremony could begin weeks, sometimes even months in advance. The little boy would have his measurements taken professionally, either by his mother’s dressmaker or a local tailor. At least one new, complete suit of clothes would be made for him. This would include new cotton or linen shirts as well as his skeleton suit, perhaps a sash or two for formal wear, plus an overcoat or other outer garments. Many letters record requests made by mothers to friends and family in the city to procure a selection of new wardrobe accessories for their sons, such as hats, gloves, stockings and shoes. Even as late as the last decade of the eighteenth century, aristocratic little boys were also often given a small sword as part of their new suit of clothes, but that practice had fallen out of fashion by the Regency. While she was working to assemble her little boy’s new wardrobe, a Regency mother would also be completing still other arrangements for this rite of passage. A breeching ceremony was not expected to be public, it was an intimate, familial event at which a young boy’s change of status would be formally recognized by those closest to him. His mother would have written to important extended family members and perhaps a few close friends, usually including the child’s god-parents, inviting them to the breeching ceremony. If it was to take place at a country estate, these guests might be invited for a house party lasting a few days, rather than just for the afternoon of the actual ceremony. Though the little boy would "officially" don his new clothes as part of the breeching ceremony, he very often would have put them on before-hand, to be sure they fit properly. But after this fitting, he would have to go back to his gowns and petticoats until he was officially breeched. The majority of young boys were eager to get into trousers, so this wait for the actual ceremony was rather frustrating for most of them. On the day of the actual ceremony there were a few final arrangements which had to be made. If the room in which the ceremony was to take place was quite large, then a folding screen was usually set up in a corner, behind which would be placed a chair and often a small table. The little boy’s new suit of clothes and its accessories would be laid out there, ready for him to change into. In some houses, the little boy’s new clothes would be laid out in a room adjoining the room in which all the guests would gather, especially if that room was not very large. In some wealthy and/or aristocratic households, the tailor who had made the clothes would be standing by to help the little boy don them. In other households, a male servant, sometimes even the boy’s father’s valet, might serve to help the young master dress in his new, male garments on this special day. When all was in readiness, family and friends would gather in the room, along with the little boy, in his gown and petticoats. By the Regency, another guest would be present, the local barber. While they wore the gender-neutral gowns and petticoats of the nursery, little boys’ hair was allowed to grow, as was that of girls. In the eighteenth century, even after they were breeched, most boys kept their hair fairly long, in keeping with men’s hair styles. But by the Regency, when the fashion for men’s hair was much shorter, the usual first step in the breeching ceremony was the cutting of the little boy’s hair. Typically, these shorn locks were gathered up and given to those in attendance as mementos of the event. Once his hair was cut, the little boy would retire behind the screen, or into the next room, to change into his new clothes. While he was changing, refreshments would be served, typically tea and cakes or other light comestibles. However, the gentlemen present might have a sip or two of something stronger than tea. When the freshly-minted young gentleman emerged wearing his new clothes, he would make the rounds of the room, going to each guest in turn. Not only would they all congratulate him on his new status, most would also quietly slip a bit of money into one of his pockets. There are a few remarks in letters and diaries about the clinking and crunching sounds some of these boys made as the coins and bank notes filled their pockets. There are no records which tell us what happened to this money, though it seems unlikely that such young boys were allowed to keep it. In most cases, their parents probably set it aside for them, perhaps even investing it in the funds for their future. Though the young boy now wore masculine garments, he would not immediatly leave home, which was of some comfort to his mother. He typically continued to be educated by a governess, if the family employed one, for at least a couple of years. In a few cases, breeching was the point at which the more privileged of the sons of the aristocracy would have tutor. Those families who could not afford a tutor might send their sons to study a few days a week with the local vicar or resident scholar, commonly at the age of six. It would usually be another few years before the boy would be sent off to boarding school. However, their mothers would see less of them as most fathers began spending more time with their sons after they were breeched, beginning to initiate them into the world of men. They might teach them to ride, to hunt, or other gentlemanly sports and activities. If the boy was the first-born, his father might begin to prepare him to take up his future responsibilities. Though he did not leave home straightaway, a boy who had been breeched had effectively left the domestic sphere of women. 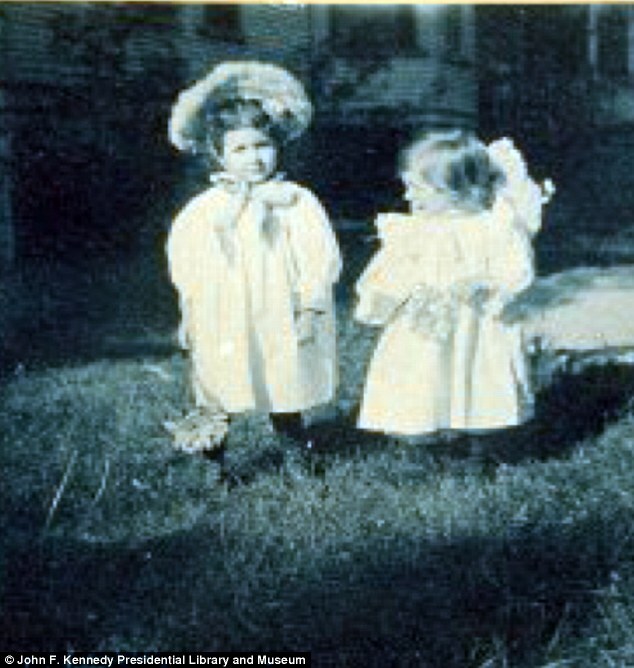 According to most scholars of children’s history, breeching ceremonies continued relatively unchanged through the nineteenth century, especially among the upper and middle classes, but fell out of fashion after 1900. Which is almost true. But there were still a few families who perpetuated this practice into the twentieth century. I know of one instance myself. Many years ago, I often went to the home of one of my school friends to play after school. There was a large, hand-colored photograph of a very pretty little girl in a white dress and long blond locks which had been framed and hung in the guest room of her house. We often played in that room, and one day I asked her who the little girl was. I did not believe her when she told me it was her father. He was certainly one of the most thoroughly butch, masculine men I had ever known. His hair was always cut very short and he had no patience with anything feminine. He regularly hunted with both rifle and bow and arrow and butchered his kills in their garage. He also did most the their car maintenance himself and had designed and built a large shed to store a vast array of tools. But when he came home from work that evening, he confirmed that the "little girl" in the picture was indeed him. He explained that his family had come over from Ireland about a year before he was born, and that his mother had followed the traditions of her family when he was growing up. He had worn skirts and long hair until he was five years old. It was only then that his mother dressed him in trousers and he said that she had a party with a few friends and family members who came on the day he got his hair cut and switched to wearing pants. He would have had to have been born in the mid to late 1920s, so his breeching ceremony would have taken place in the early to mid-1930s. There may well have been other little boys who were raised in the same way, well into the twentieth century, in both Britain and North America. A breeching ceremony can serve the plot of a Regency novel in a variety of different ways. If conflict is needed between a married couple, or even an aristocrat and his governess, they can disagree on the age at which the young heir should be breeched. The conflict might come later, after the little boy has been breeched and his mother feels he is being pushed into manhood too fast. Perhaps a domineering grandfather is pressuring the young couple to breech their beloved son early, or an interfering grandmother tries to take over the arrangements for the ceremony from the boy’s mother. A breeching ceremony can also be a new and different excuse for a country house party, particularly if the aim is to bring together the majority of the members of an extended family. Feuding factions of the family who all come together for the breeching of the heir offer the potential for any number of interesting problems while they are all under the same roof. Or, mayhap a family in financial difficulties has a breeching ceremony for their little boy and after guests have departed they discover a large sum of money in the pockets of his new skeleton suit, more than enough to pay for his education. Dear Regency Authors, how might you work a breeching ceremony into one of your stories? 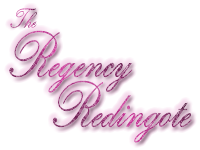 This entry was posted in Apparel & Grooming and tagged Clothing, Etiquette, Regency. Bookmark the permalink. I have a few family photos of unbreeched boys at the turn of the century, generally though so far as I can gather the suit of more boyish clothes was just a part of the 3rd or 4th birthday celebration when the trousers etc were laid out overnight by the boy’s mother to get dressed into. House parties with a load of relations present are however usually excellent venues for a good cozy family murder which is how I might use this… I have used in speech the comment to a youth that he is behaving like an unbreeched moppet to censure bad behaviour. “Unbreeched” as in wearing skirts, or in their birthday suits? 😉 What was the date range for these photos? If they were early in the twentieth century, it would make sense that the so-called “breeching” ceremony had dwindled to the point of just putting boys into trousers on a third or fourth birthday. Especially since by the 20th century, birthdays were regularly recognized and the concept of a formal family breeching ceremony was fading away. The photo/portrait at my friend’s house of her father was fairly large, about 12 inches wide and 18 inches tall, in a carved frame, and it had been hand-colored. He looked like a little girl going to a party, in a white gown and pinafore, with his hair in what we used to call banana curls, tied back with a pink ribbon. Of course, that was just about the time that pink was switching from a boy color to a girl color, and if his mother was such a traditionalist, it would make sense that she would stick with the more old-fashioned pink for boys. I can just imagine it, a large, rambling country house, filled to the rafters with a large extended family, among which there are various factions on the outs, all come together for the breeching of the heir. Let the murder and mayhem ensue! Skeleton suits were often made of hard wearing fabrics like cotton de Nimes [denim] or Nankeen, but I wager the hard wear little boys gave them, especially after first freed from the tyranny of skirts, led to frequent tearing, and I’ve thrown in conversation around the gathering of women in such occupation as repairing this essential and doubtless much abused garment. You are quite right, denim and Nankeen were the preferred fabrics for skeleton suits, and they took a lot of punishment, not only from the little boys who wore them, but from the laundress on washday as well. I get the sense from some snippets of letters and diaries that I have read that most little boys had two or three skeleton suits for hard play, and those were always made of sturdy denim or Nankeen. However, most had one or two which were kept for more formal occasions, and those suits might be made of better, if more fragile fabrics, more fitting for church or the drawing room. Middle class and lower class mothers or sisters would certainly mend abused skeleton suits, but I suspect in the houses of the upper classes, one of the maids would be assigned that task. Few upper class women would lower themselves to mending. Fascinating detailed description of a ceremony forgotten by most. Thank you. I am always intrigued at how various ceremonies and rituals evolve and/or disappear as our world changes. I suspect few little boys today would be pleased to have to endure a breeching ceremony, though even now, a remnant of it survives in some families as the little boy’s first haircut. Many of my friends still treasure the locks of hair they collected at their sons first visit to the barber. My grandmother in the UK ,born 188? told me that as a girl she hated it when at the age of 8? her younger brother was breeched at the age of 4? She felt a great loss as her brother was now “male” and not one of the group of sisters. Another interesting point is that when breached the boy wore clothes that were less restricting than petticoats, dresses and often stays. Boys were therefore liberated to enter the man’s world, even though as an “apprentice man”. The objective was that he would grow up tall and strong. Girls continued in restricting clothes and stays ensuring that they grow up dainty, refined and with good posture. This fits the model where boys need to grow up to men who are strong to do manly things and girls must be socially attractive to catch a rich husband. That is very interesting. I found several references which indicated that many mothers were saddened at the loss of their “little boys” at the breeching ceremony, but nothing about how their female siblings might have felt. Clearly, this event could be a wrenching experience for many of the women in that little boy’s family. Everything I read indicated that nearly all little boys were delighted to be officially breeched. The reasons were exactly those which you stated, the new freedom of “men’s” clothes as well as being taken seriously by the other men of the family. I love your phrase, “apprentice man.” It is a perfect description! Though none of the period documents I read commented on this concept, several social historians, mostly female, noted that the breeching ceremony was a rite of passage by which a boy became a man (or an apprentice man) while his sisters essentially remained children, dependent upon others, as they never experienced a similar rite of passage which designated them as officially women. They stayed in skirts, and as you say, were groomed to find a wealthy husband. Thus, they moved from dependence on their fathers to dependence upon their husbands, never being allowed any real independence. Thank you so much for sharing your grandmother’s memories! At least they had that, but as I recall, there was no real ceremony for girls, with family and close friends in attendance, so it was not as definitive an experience as the breeching ceremony was for boys. Plus, this change in garments did not happen until after their adolescence was over, so they missed all the fun the boys had at that age, in their less restrictive garments. Boys definitely had a better deal. I got interested in breeching when I was researching the Regency era, but this is the most in depth article I have found yet. How did you find out all this information? Anyway, I’ve recently began reading Regency romance, but I haven’t seen many mentions of breeching. I really like that it was made into an event. That sounds like great story fodder for many writers. Thanks for the great article. I was a museum and historic house curator in my salad days, and I did a lot of research then around events which took place in the homes of the past. These days, I am usually reading and researching things which interest me, and over time, I pick up snippets of detail here and there, until eventually, I have enough to put them together to make a more complete picture of something which has piqued my interest. It is rather like putting together a jigsaw puzzle, but I do enjoy the detective work. When it comes to breeching, many costume and social historians gloss over it, but I wanted to provide as much detail as I could, should any authors wish to use it as a feature of their story. I am glad you enjoyed the article and I hope you will enjoy some of the others you will find here. One American cultural reference to unbreeched boys would be the Popeye cartoons; Swee’Pea, a perpetual baby boy, is almost always seen in a trailing infant dress with a sailor’s cap. Some of the earlier comics had him in a frilly infant’s cap, and he sometimes had different hats related to the storyline of the comic or cartoon. The time period for the Popeye comics was the early 20th century, late 20s and 30s. I had not thought of that, but it makes perfect sense, since there were still some young children of either gender who were dressed in gowns at that time. And those who were creating those cartoons were probably old enough to have gone through that period in their own childhood. Wonderful post again, Kat. Thank you!!! Thanks, I am glad you enjoyed it. I had always been curious about “breeching,” which I found mentioned in various private papers as well as in some social histories over the years. It was a challenge to research, but in the end, I think it was worth it, as I got a much better picture of what it meant to our Regency ancestors. Puts the manly breeches on. Half so rational as his. Is he not a happy lad? Sports for girls and punies weak! Without any fear to fall. From the colour in his cheek. Now the breeches are put on. Thank you so much for sharing that poem, it is charming. I knew it existed, since I found a reference to it in Google Books. Unfortunately, the only book I found which included it and was available to me online did not allow any previews and I did not have the time to seek it out in hard copy. It was very kind of you to post the full poem here so that others interested in breeching can read it. Ditto! Tks for sharing, Roz. It’s really melancholic. Poor mom and little boy that had to grow up so quick. Mmm…I wonder if the ‘cub scout = old enough for a pocketknife” thing is a slight remmant of the small sword? An interesting analogy. Certainly both had sharp blades and required their owner to take care with them, which is part of becoming mature. Thanks for stopping by and offering something to think about. So…I was reading a Dale Carneige book. There’s a mention there of a 3 year old who had a problem with bed-wetting. Scolding and spanking and reminders that the parents wanted to keep the bed dry didn’t actually work to keep the bed…well, dry. Also, he claimed that grandma (who he shared a bed with) had wet the bed, not him. So the parents started thinking about what the boy wanted. 1)Boy wants to wear pjs like Daddy, not a nightgown like Grandma, 2)He wanted his own bed. Grandma offers to buy 3 yo a pair of pjs if 3yo reforms. Grandma doesn’t object to his own bed either. That actually worked and the little boy reformed. ‘Wearing Pjs now like a little man. And wanted to act like a little man. And he did’. So the little boy wants to wear trousers, instead of a gown. Granted, nightwear. Still, top/jacket and trousers instead of a gown. Does this sound at all familiar? Sorry, I don’t have children, so have no experience in that area. But being of independent mind myself, I can see how getting one’s way can improve one’s view of oneself and thus also improve behavior. Many people do rise to what is expect of them, so if this little boy felt he had been heard, and got what he wanted, but with expectations of more mature behavior on his part, it makes sense that he would rise to the occasion. Sure. But I was just thinking that prior to this, he was wearing a nightdress. Some info: My uncle was born about 1929/1930 in Western New York. 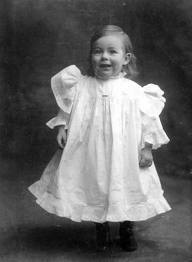 We have a photo of him in front of the art gallery in a belted loose dress like his mother, in about 1935 or 36. In a 7 year old photo with sister he was in breeches – or knee length pants. His father was raise in WNY but were all born in Ireland. Mother’s family was from North Carolina since at least the 1740s. His hair though…seems to of always kept short unlike his sister’s. They were middle class. There was also about a 4- 5 year gap between the two children. Thank you for sharing your memories. This is the first instance I have heard of a boy child wearing a gown, with short hair. Most interesting. It is most interesting that primary emphasis for when to breech is due to mother-father parental control ! We have a discussion going in an 18th century group. Do you happen to know if boys in England from working class families would be breeched earlier or later in the range appropriate for breeching? We are wondering where the importance is placed and why. I know for my uncle (U.S) he did wear cotton “short-overalls” when playing in the yard. It was a practical choice. But wore the dresses out in public. Which might be why his hair was short. I would think the great depression is part of the reason this practice was stopped. It would of been seen as extravagant when so many 4 and 5 year olds would of been brought to the factory with their mothers to work in the U.S. There was very little information available on breeching for the boys of the lower classes. Curiously, I did read that in many working class homes, since nearly all garments were hand-me-downs, the boys in the family were typically breeched when they had grown enough to wear their next eldest brother’s clothes. Very little ceremony seems to have gone into such events, and the goal appears to have been to put the young boy to work as soon as possible. Apparently, they could not work while wearing skirts. Based on that, it would seem that breeching for boys of the working classes was driven by economic necessity rather than tradition. The age of the boy was less important that his physical size. There is something else to consider with regard to clothing by the time of the Great Depression, c1930. Off-the rack, machine-made clothes were available for children, and trousers would have been less expensive than skirts, since they required less cloth to make. Trousers could also be made of less expensive, sturdy fabrics which would last longer than the fabrics used to make dresses for girls. So, for any or all of those reasons, parents at that time may have chosen to put their little boys into pants rather than skirts. Famously Ernest Hemingway was breeched and the experience caused him a fair amount of trauma as he had identified with his sister. It’s felt that his shearing at the time also became the focus of his hair fetish, which runs through his fiction and has been a source of much literary analysis since his posthumous novel The Garden of Eden was published. Thank you for taking the time to share this information! This is a really interesting article – thank you so much. I’m currently writing my dissertation about mothers and sons in Early Modern England and how mothers shaped and constructed their son’s developing masculinity. I am using the breeching ceremony as a basis for my chapters – the shift from the feminine to the masculine world and I was wondering please if you have any footnotes/bibliography/reading list for this article as I would love to delve into some of the reading you have used? The breeching ceremony is a particularly esoteric topic, for which there is little published information. I picked up tidbits here and there about the breeching of young boys over a long period of years, as a graduate student, museum curator and in continued research throughout my life. At this point, I would not be able to provide a full list of the sources I consulted, there were just too many of them. However, you might like to have a look at one of the last comments posted to my article on leading strings, in which I provided a brief bibliography of the books with information on children’s clothes which I consulted for a couple of other articles. In addition, you can run searches on key words/phrases like “breeched,” “breeching ceremony,” and even “skeleton suit,” in the “Books” section of the Google search engine. To find the “Books” section, run any search, then at the top of the results page, just below the input box, following the “All” link, you will see several other word links. If “Books” is not visible, click the “More” link and select “Books.” Though most books are not published in full on Google, their contents can be searched and, if any of them turn up results on your topic, you will have the bibliographic citation and will be able to get a copy from you local library. You will also have the advantage of knowing the page numbers for any material in which you are interested. I would also urge you to seek out the reference librarian at your university library. They can provide you with many more useful search and research tips which will help you find the kind of information you want for your dissertation. Thank you so much for your speedy response and helpful advice Kat! Reblogged this on A random blog – run by an Autistic Against Anti-Vaxxers..